Motorbike Annie is an interesting one-off on JK's UK imprint. No clue who Del is, but Motorbike Annie is a long, moody, but ultimately rewarding track. Like an ambitiously produced busker; Del reminds me of a bit of Tymon Dogg, while the track builds and builds with the understated mellotron, obligatory motorbike sounds and fine guitar leading the track to a very satisfactory conclusion. 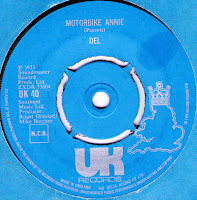 Motorbike Annie was compiled on the Bubblepop comp (RPM) a few years back. It's not just Jonathan King singing? Sounds like him. ... and, more importantly, an Elton Motello connection! That track was unbelievable, I had to say something,just builds and builds, and I bypassed it before thinking it would be slosh. Thanks greatly. Hi, this song is by a fellow named Derek Parrott. Del must have been an old band of his. been celebrating him and his work. He has a great full length album called Open Up. It was recorded in '77, but I don't know if it came out until recently. Here is a link to a you tube video of anouther covr of this song performed last night on Whidbey Island In memeory of Derek Parrott who passed about last week. Thanks to all for the info above although it is sad news as well. I've always wondered who Del was as I really like 'Motorbike Annie' and 'Gypsy Girl' which I have on the Bubblepop CD. Like so many songs I know it should have been a hit - just right for 1973 and any time in my book.